Long before we had electric motors on our C&Ps & Gordons, they were operated by foot-power. The operator would pump the treadle (aka "kick the press") to make it operate. But most presses made - at least until the 20's or so, came with a treadle as standard equipment. 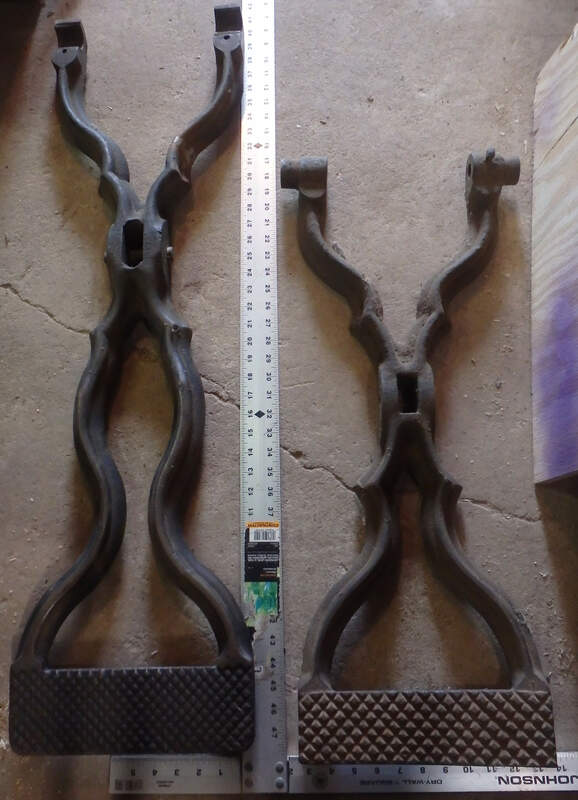 Many of those treadles - and treadle hooks have been lost over the years. 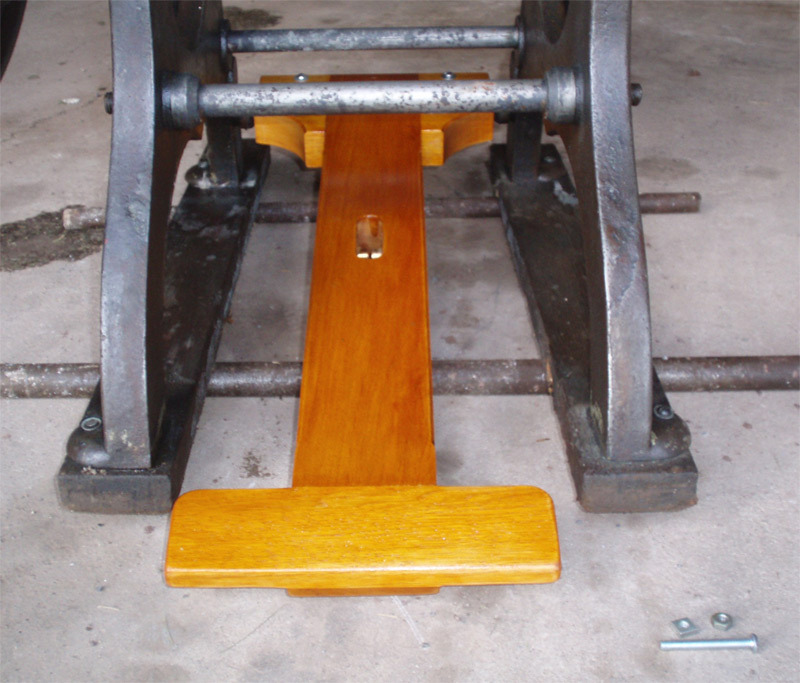 Replacement cast-iron treadles are available - and have been reproduced by Excelsior Press Museum, Bindery Tools, Hern Iron Works and others. We fabricated a simpler wooden treadle for the musical "Newsies"
Below we have the specs of an 8x12 and 10x15 Early Series C&P treadles. NOTE: New Series Press treadles are slightly different and they two may not be interchangeable - the mount on the back sharft is different. 10x15 on the left, 8x12 on the right. 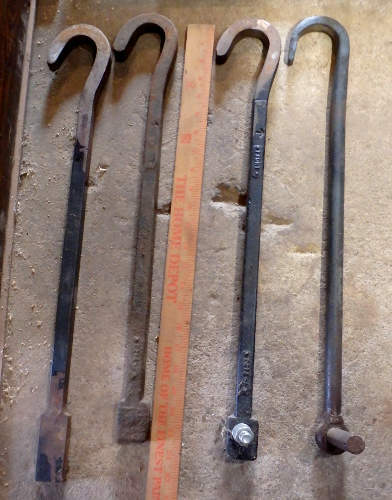 Treadle hooks are made of bent steel as well as cast iron. 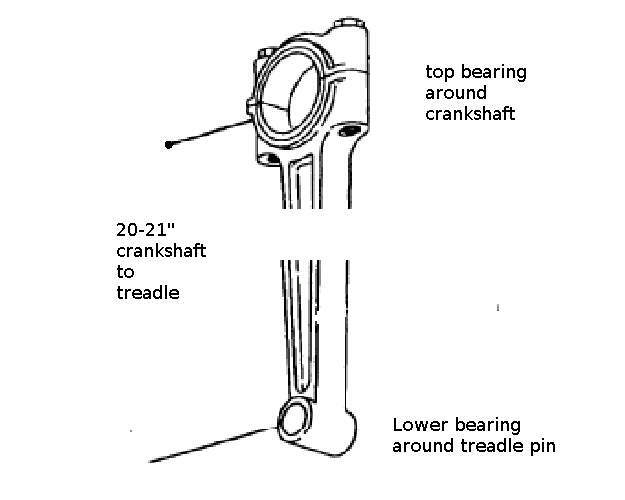 Treadles hang from the crankshaft and are connected to the treadle using a bolt or pin at the bottom of the hook. Fabricate this connecting rod of wood - a nicely grained 2x4 will do well. Be sure to varnish or paint finished piece to protect the wood. Sarah bought Rich Polinski's restored his 8x12 C&P, but wanted to operate it with a treadle. Her press had the necessary crank, but no treadle or hook... So he built one for her - of wood.